Puppetry in its many forms - string-operated, hand, finger, shadow - are used to animate and communicate in a fantastically interactive way, bringing stories and verse to life. Ashley Bryan, noted award winning African-American children's author and illustrator, made his first marionette puppet, Petunia, in 1934 (in collaboration with his sister, Ernestine) when he was just eleven years old. 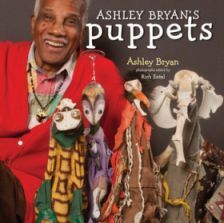 Ashley Bryan's Puppets: Making Something from Everything is an engaging picture book of color photographs illustrating his “family” of puppets, as he affectionately calls them, comprised of thirty-six imaginatively constructed works created over the past three decades. Drawing upon discarded and natural materials that he discovers walking along the shores of the Cranberry Isles off the coast of Maine, he has the ability to take marine debris washed in with the tide - weathered bones, sea glass, driftwood, shells, torn fishing nets – and combine them with common items and scraps of textiles to create something extraordinary. Among the hundreds of languages spoken across Africa and its Diasporas, some are widely used for inter-ethnic communication and Bryan derives his puppet names using some of them, including Ayodele (Yoruba/Nigeria) ‘Joy Comes Home’; Kwesi (Akan/Ghana) ‘Conquering Strength’; Nkosi (Xhosa/South Africa) ‘Ruler’; Cazembe (Luba/Bantu/Democratic Republic of the Congo) “Wise One”. In addition to a name, the artist gives each of his puppets an epithet and a rhyme in the 1st person voice of the puppet. Some poems are related to their repurposed materials and others to sharing their universal themes, including joy, imagination, peace, family, and guardian spirits. These proverbial-style poems reflect a folklore style and some conclude with entertaining life lessons. Are cast-off challenges to me. A life that we may celebrate. Photographer Ken Hannon has played a significant role in bringing these puppet creations to the attention of a wider audience. The individual puppets are photographed both in their entirety and in a close-up detail of each head. Alongside each two-page spread is a short, rhyming poem by Bryan. This is not a ‘how to’ book. There are no directions or patterns, but the photographs of the finished works are intended to inspire the imagination of young (and older) readers. Featured among its eighty pages, Hannon’s camera infuses Bryan’s puppets with an authenticity and presence. He accentuates every detail and texture, directing the viewer’s eye to each creation by positioning the puppets as isolated works of art, each floating on a saturated and deeply rich brown background. He deliberately leaves out any distracting elements – shadows, tables, bases – to further the enjoyment and understanding of the works of art as the unique vision of the artist. The publication has the look and feel of an exhibition catalog, yet embodies the multiple ways that the artist engages in art and poetry. In the Afterword at the end of the book, the artist suggests two small challenges for the reader: find and create one’s own poem for each of three puppets: Moriba, Barnabe, and Chioneso in a double-page spread; and find three puppets that do not appear in any lineups – a clever way to entice closer looking. Bryan’s puppets can be a wonderful teaching tool through which children can learn to think about the diversity of ethnic groups and our multicultural world. Overall, Bryan should be credited with inviting the reader to be inspired to explore invention through recycling, repurpose, and redesign -- a timely, interdisciplinary and fun goal!